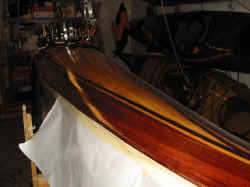 A sealer coat of epoxy filled most small cracks, and those remaining were filled with an epoxy and wood dust filler. The sealer coat prevented stain marks surrounding filled cracks. The deck exterior has one layer of 6 ounce e-glass on the outside. 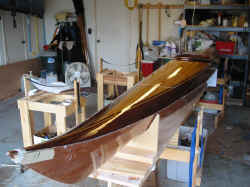 The epoxy was applied to the fiberglass with a squeegee and 3" wide roller. 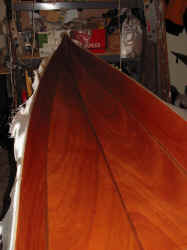 The deck was sanded after two filler coats, then another two coats were added. 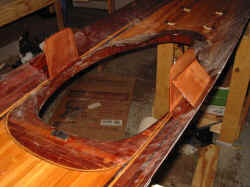 A mahogany coaming rim is a messy process to but I like the look. 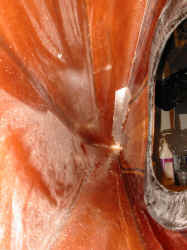 The interior of the hull and deck are both covered with 4 ounce S-glass. It was my first experience with S-glass, and I am quite pleased that it wet out clear. The exterior hull was fiberglassed with one layer of 6 ounce e-glass over the whole hull, and a second layer of 6 ounce glass on the bottom, over the chines, and on the stems. 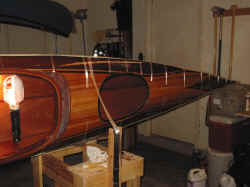 A small mahogany stem strip covers the end grain. 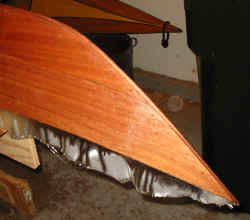 Spreader sticks across the deck ensured the proper beam was maintained until the hull and deck were joined. 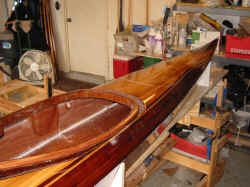 I find the sticks especially important before both sides of the wood are covered with fiberglass. 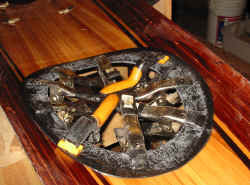 The hatch holes were cut out with a jig saw. 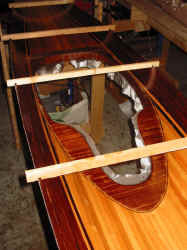 The cover was then reattached so a composite hatch rim can be built. 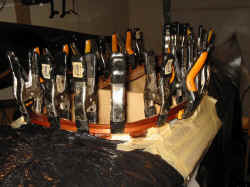 It was repositioned precisely with strapping tape, slivers of wood and hot melt glue. 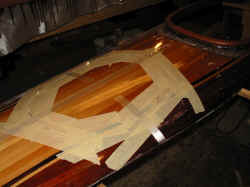 The masking tape stayed on the deck until the composite hatch rims are glued on, to keep things neat. 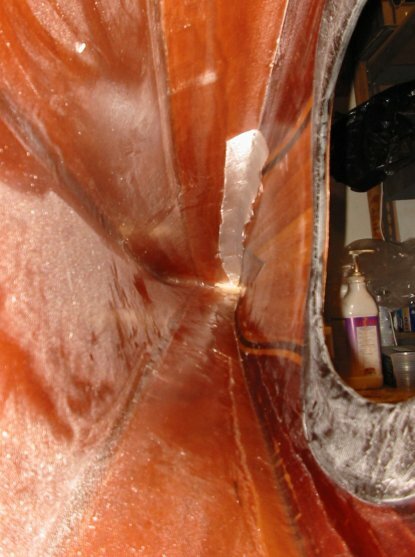 The composite hatch rim was made from alternating layers of 4 ounce S-glass and 6 ounce woven carbon cloth. 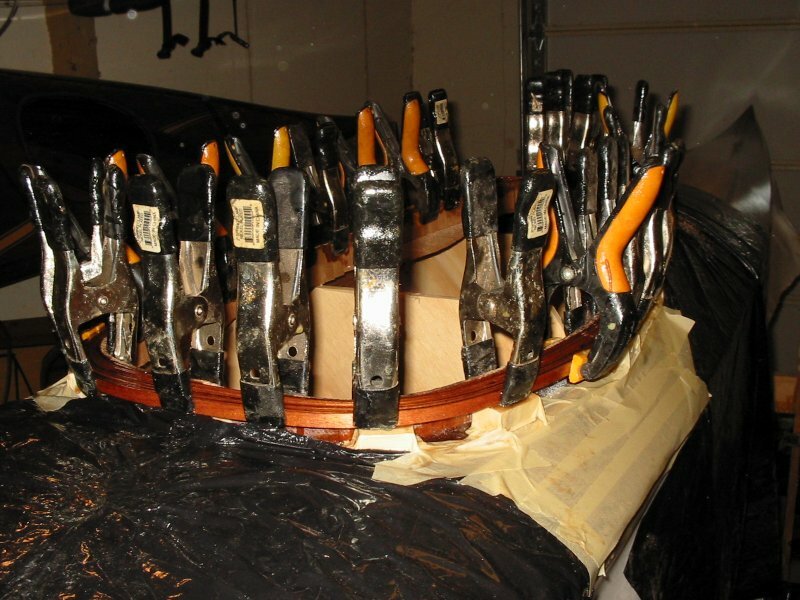 A total of 7 layers. The rim has a 3/8" deep channel for a 5/8" thick foam seal. 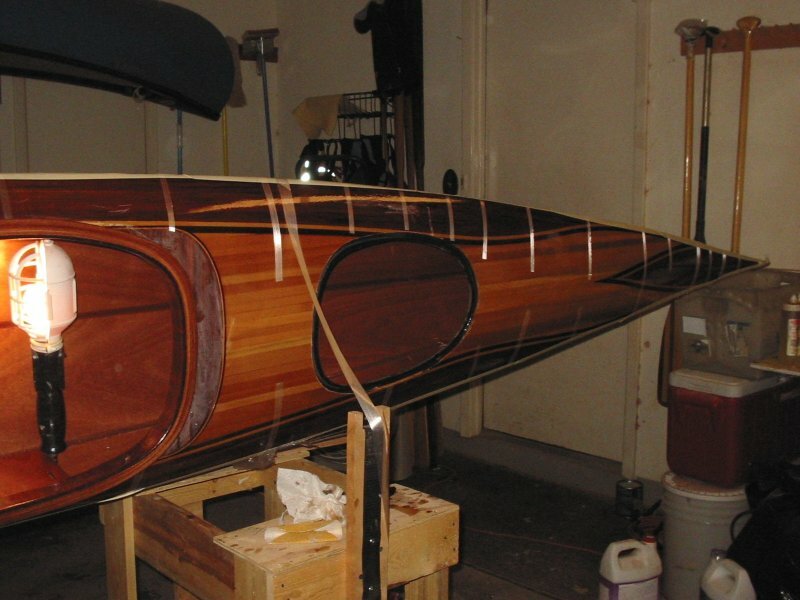 Hip plates really help with rolling or edging a kayak. I'll cover them with foam to a 14" width when outfitting the kayak. 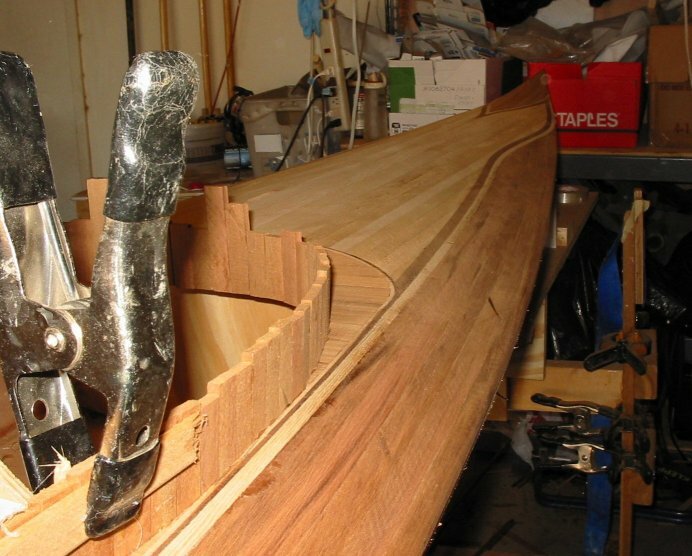 The supports on the side of the hip plate provide strength and a place to thread a cable lock for security. A small amount of microballoon-thickened epoxy poured at each end of the hull allows a 3/8" hole to be drilled through the hull for a handle-hold rope. 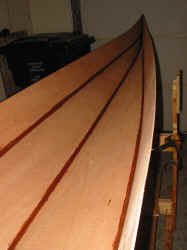 After joining the hull and deck together, another ounce or two will be poured in each end to seal and join the tips. Joining the hull and deck are a messy job. For the internal seam, partially thickened epoxy is spread in the inside seam to strengthen the joint witha mini-fillet that prevents bubbles. 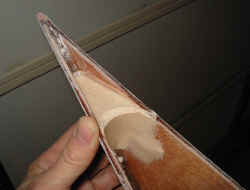 Pre-wetted is unrolled along the inside seam. For the hard-to-reach ends, fiberglass tape is hot glued into position before joining hull and deck, and wetted-out with a brush on a stick.